This lightweight compressor nebuliser weighs just 270g and has a low noise operation of 46dB, allows for a very quiet and comfortable operation. This compact compressor nebuliser also has a small footprint, so doesn't take up much storage space and is very easy to use and maintain. The Omron C801 is the ideal compressor nebuliser for home use. Featuring the Omron Virtual Valve Technology (VVT) medical chamber, the Omron compressors continue to be the most known type of device used for inhalation therapy for all ages. Thanks to the robust build and reliable operation, Omron compressor nebulisers are suitable for versatile usage. The VVT nebuliser chamber adapts to your breathing, thus matching your breathing pattern. This technology reduces drug wastage while breathing out and maximises the drug availability when breathing in. The VVT means the nebuliser behaves like other nebulisers but the ideal design means there are fewer parts to lose and less parts to clean, meaning a more hygienic and easier nebuliser chamber to maintain. This range of nebulisers has a low noise operation of 46 dB and features a design, with small footprint and is easy to use for the patient. This mains-operated compressor nebuliser is an ideal choice for home use. These continue to be the most known type of device used for inhalation therapy. 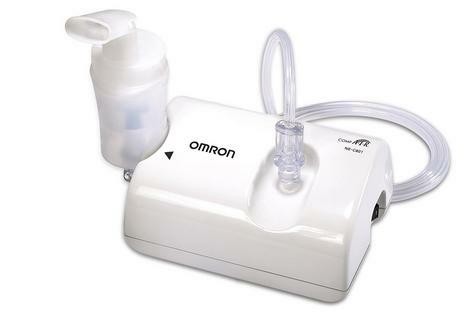 All OMRON compressor nebulisers are supplied with our V.V.T nebuliser medication chamber. Thanks to the robust build and reliable operation, OMRON compressor nebulisers are suitable for versatile usage. The V.V.T nebuliser chamber adapts to your breathing, thus matching your breathing pattern. This technology reduces drug wastage, while breathing out and maximises the drug availability when breathing in. The V.V.T means the nebuliser behaves like other nebulisers but the ideal design means there are fewer parts to lose and less parts to clean, meaning a more hygienic and easier nebuliser chamber to maintain. To wash your nebkit, use hot water and a neutral detergent or wash in a dishwasher. To disinfect, use chemical disinfectants (please refer to manual for details) boiling for 10-30 minutes. Full instructional guidelines are supplied with the C801 compressor. Please read the instruction booklet supplied.